- EX Ein trigger > 2nd shoot properties have been changed. The projectile hits twice and gradually increases in speed. - Weak crow bites has less invincibility. Note that it is only upper body invincible. - Minute spike properties changed (includes air). Move initiates at a consistent speed regardless of distance to the opponent. - EX chain drive has special hit properties. Yamamoto: "Although there are several nerfs, it is possible to score extra damage using air minute spike and the special hit properties on chain drive which was not possible in the arcade. You’ll be able to make up for the nerfs by jumping on chances to aggressively score additional damage. Worthy of special mention – EX 2nd shoot has been changed. It was often used to zone, but can now be used to gain the initiative from long distance. To put it bluntly, his play-style is very versatile, like Kyo Kusanagi, except much better. He has the combined zoning prowess of both King and Athena, except without the crippling recovery. He has immense juggle potential like Ash in Sans-Cullote mode, except he doesn't have to sacrifice all the meter or be in the corner. He has all the anti-air capabilities of Leona/Ryo and Robert and still follow-up with an attack without drive cancelling. He can rush down like Takuma and Shen but with better pokes. He can attack really fast and link combos together with ease like Yuri and Kim. He can lock the opponent down in the corner like Raiden except without burning all the extra meter. His main weaknesses (which is similar to Billy's) is that he has rather weak damage mid-screen and doesn't have many hard knockdown setups for okizeme pressure. His meterless combos are lacking in damaging but they make up for pushing the opponent towards the corner for more intense offensive pressure if applied aggressively and with confidence. More meter dependent for reliable, damage-dealing combos. far A: 25 damage, chain-able & whiff/cancel-able, A simple punch attack, really fast, nice range. Great for stopping jump-ins if timed correctly. Doesn't have much combo use, but could probably get away with using it as a quick fake-out by whiff cancelling it before an opponent runs up. far B: 30 damage, his mid. Actually, despite looking like a low kick it's actually aimed mid. Has good range for a far normal. Decent start-up, possibly good for pokes and other strategies/tactics to annoy the opponent. far C: 80 damage, cancel-able, hits mid. A right hook aimed at the opponents face. Decent reach, decent recovery for a far strong normal. It seems rather promising, good for that extra boost as getting them into the corner. far D: 80 damage, hits mid. A high kick, a really high kick, runs the same properties as his Far C except it goes high; meaning it can be used as an anti-air when timed correctly. It isn't cancel-able (except in HD mode). s.C: 40+28 damage, cancel-able, hits mid. A punch aimed at the gut, does two hits, comes out fast, good recovery. The combo starter of choice as it combos into just about everything if not everything. s.D: 70 damage, cancel-able, hits low. Similar to close C, more range, slightly slower, and hits low. d. A: 25 damage, chain/cancel-able, hits mid. Crouching punch, similar to stand A. Useful for chaining together lights into combos. Good range and recovery as expected, hits high. d. B: 30 damage, chain/cancel-able, hits low. A (really) low kick. This is the combo starter from crouching normals. This move is good, really good. Great range/recovery, good start-up, and amazing combo opportunity. d. C - 70 damage, cancel-able, hits mid. An uppercut punch, another good combo starter from crouch normals. Comes out a little slow so it requires some timing to use an anti-air. Good combos options when used after a jump-in. d. D - 80 damage, whiff cancel-able, hits low. A sweep kick used to trip opponents, slow recovery. j. A: 45(40) damge, cancel-able, hits overhead. A jumping light punch, mediocre range, so it be used as an air-to-air. Can combo into his Air Minutes Spike. j. B: 45(40) damage, hits overhead. A jumping knee attack. Comes out fast, but still the range isn't much better than j.A. j. C: 72(70) damage, cancel-able, hits overhead. Jumping strong punch. Works well with pressure when your opponent is in the corner. It's a meaty jump-in and crosses-up. Also good for short hop blockstrings and crossups. It's important to note this is your most reliable tool for scoring a crossup. j. D: 70(68) damage, cancel-able, hits overhead. Jumping overhead kick, great range, good recovery/start-up. Perfect for block strings and corner pressure. The hit-box is a bit more horizontal than it was for pressure. It will hit standing opponents, but will whiff crouching opponents if timed improperly. Either way, causes decent hit stun, good air-to-air, and decent range. Still a very good normal. CD: 75 damage, whiff/cancel-able, hits mid. An angry "piss off" kick to the face. Decent speed and range. Use at mid range or whiff cancel. Whiff canceling allows to be comboed into just about anything with a fast start-up. Can be used after Eins Trigger + Second Shell juggle when in the corner. j. CD: 90(80) damage, cancel-able, hits mid. K' does a long ranged kick to whatever is below his boot. Good priority and range. Cancellable into Air EX/Minutes Spike. When used on counter hit, puts the opponent into a juggled state for a follow-up attack. GCCD: 10 damage, hits mid. His old pre-KOF 2003 CD attack. Spot Pile = (b/f+C/D) close 100 damage, can be broken, causes a hard knockdown. K' grabs his opponent, bends them over with one hand, then uses his other arm to elbow them to the ground. One Inch Punch = (f+A) 75(57) damage, cancel-able, hits mid. K' steps forward then does a thrust punch to the opponent's stomach. Decent range. Too slow to be used on its own without a special set-up, like after his EX Eins Trigger + Second Shell juggle. Using it after that can allow you to cancel it into either of his DM's. When used on its own, and near the opponent, it will cause a crumple state. After a strong normal, it can be used to combo. Eins Trigger = (qcf+P) - K' moves his right arm in front of him and forms a circular flame. Comes out fast, has good recovery, and can be used during blockstrings without the follow-up attack. It can also be used to zone the opponent out when they're trying to jump-in or throwing a projectile. Also good for safely building meter when on the other side of the screen. Weak (A) version comes out faster than the strong (C) version. However, the C version has longer active frames and changes the properties of the followups. ∟ Second Shoot = (f+B) - After K' forms the flame in his right hand he kicks it toward his opponent. Long range zoning tool of choice. Can be used in block strings, second shell follow-up attacks, building meter, cancelling out other projectiles, or to just keep your opponent out of your face. Does not knock down. The A version travels slowly across the screen while the C version moves much faster. EX Second Shoot = (f+B) - When used after EX Eins Trigger the properties change a lot. This move does more damage, travels slowly at first but increases in speed gradually, and goes through normal projectiles. It hits multiple times and can juggle opponents who were hit in the air. ∟ Second Shell = (f+D) - After K' forms the flame in his right hand, he kicks high into the air making flames come out at the top of his boot launching the opponent into the air. Anti-air/jump-in zoning tool, but less useful than in Arcade. The move comes out slower and the hitbox for the kick is drastically reduced so it's possible to whiff a poorly timed Second Shell. It is also the preferred combo start of choice whether using low crouch normals or standing close normals. Causes juggle state. Be warned: Do not do this move on block. It's a free combo for your opponent. A version moves faster while the C version is slower, but covers more area and has longer active frames. EX Second Shell = (f+D) - When used after EX Eins Trigger the properties change just a bit: more damage, more hits, and launches the opponent higher into the air, making it easier to follow-up with an attack. Blackout = (qcf+K) - K' slips into the shadows to quickly and stealthy run up or get behind his opponent. Weak version makes K' travel about 1/4 of the screen, while the strong version makes him travel about 90% of the screen. If the opponent is any closer, K' will go past them. Neither version makes K' invincible so he is vulnerable to attacks during this move. Use it to quickly avoid jump-ins. (EX) = qcf+BD - Faster start-up and recovery, goes about as much distance as the A version. K' is also completely invincible while this move is active. Perfect to use to get out of the corner. Minute Spike = (qcb+K) - K' jumps forward to do a flying kick to hit the opponent in the face. Extremely good for carrying the opponent to the corner. Use it before Crow Bites but after Eins Trigger + Second Shell. Weak version goes a short distance, while the strong version goes much farther. A change from arcade is that it does not auto-track activate. This means the animation will lapse on its own not when it comes into contact with someone. Too far away targets or ones too high will make this whiff. (EX) = qcb+BD - Gains "Guard Point" properties, will auto-guard then bypass any normal that may be used to counter-attack this move at start-up. Air Variant (qcb+K) in air - K' jumps forward to do a flying kick to hit the opponent in the face. Good start-up but mediocre recovery if you whiff it or on block. 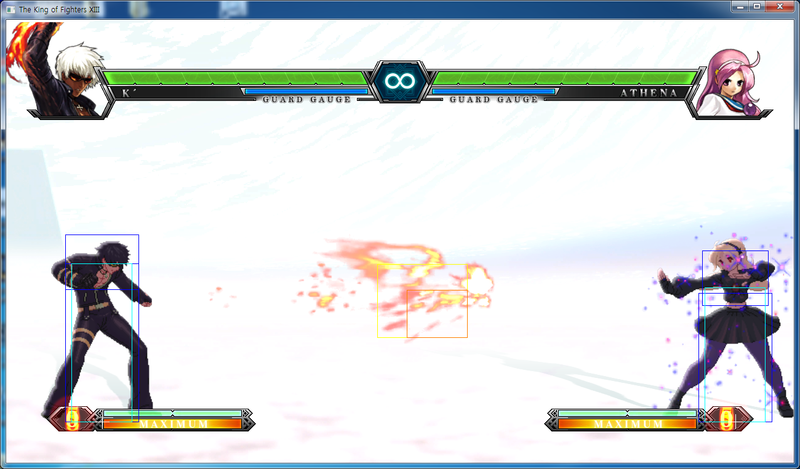 Another added bonus is that you can link a lot of counter-hit normals or a regular j.CD into this. It's your #1 move for continuing damage off of random air-to-airs. This move can be TK-ed (Tiger-Kneed) so that you do it almost instantly off the ground. You do that by doing qcb,ub+K (be sure to delay the kick button just a little). (EX) qcb+BD in air - Invincible from start to recovery, and does more damage. ∟ Narrow Spike = (qcb+K) ground only - After K' jumps forward doing a flying kick, he slides on the ground to kick the opponent in the shins. Comes out pretty fast, but has worse recovery than its arcade version. Proper spacing can make it safer, but the proper spacing is likely halfway to the entire length of the screen. Strings combos together very well, Drive and Super Cancellable on hit. During a move's recovery or animation, you can buffer Narrow spike so that it "skips" minute spike. You also can free cancel a dp+A if someone gets hit by your slide. (EX) = qcb+BD - Significantly faster recovery. (EX) = dp+AC - Complete invincibility through out the whole move, more damage, does 11 hits, mimics his Heavens Drive DM from KOF XI. ∟ Crow Bites Plus = (f+K) (C version only) - After K' launches the opponent into the air from Crow Bites, Plus will add an extra hit to knock the opponent down. This move activates automatically during EX Crow Bites. This knockdown cannot be recovery rolled so it is a "Hard Knockdown". Heat Drive = (qcfx2+P) hold to delay - K' holds up his right hand and forms a flame, then quickly dashes past opponent launching them high up into the air. Very fast from start to finish. The dash does NOT make K' go through projectiles. Switches sides with opponent after the initial hit. Can also be MAX canceled into Hyper Chain Drive after you hit the opponent but you must be in HD mode. Holding down whatever punch button you used to activate the move will delay it for a brief period, the holding time is about 3 seconds. When the opponent is hit, there is a moment where they bound off the ground and allows you to do an Air Minute Spikes to continue. Chain Drive = (qcf hcb+P) - K' tosses his a flame imbued sunglasses toward his opponent and, if it hits, he quickly dashes forward elbowing them in the gut. Time stops for a brief moment while K' takes his time to put his shades back on then proceeds to do a long combo consisting of multiple hits before he knocks them to the ground with a One Inch attack. No real difference between the weak/strong versions. MAX cancel-able on the 12th hit when in HD mode. The unique thing about the start-up is when K' throws the flamed sunglasses it can go through projectiles because it has a guard shield of two hits. If the opponent throws out a projectile this move will punish it. This move can also be used as a pseudo anti-air. The last hit causes a hard knockdown. 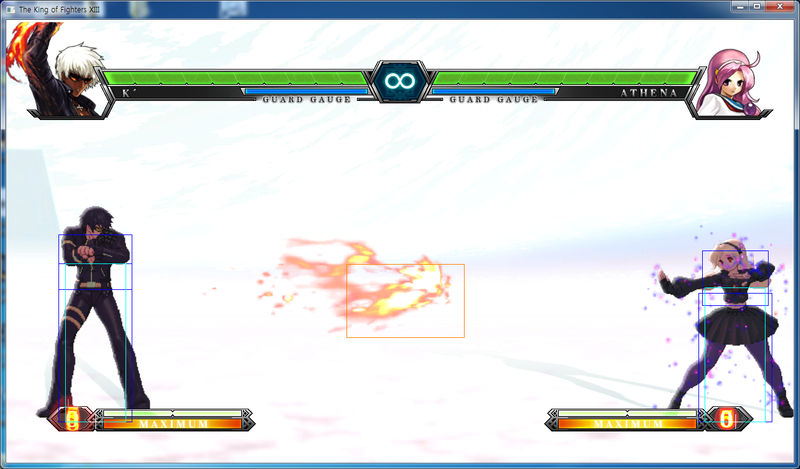 (EX) = qcf hcb+AC - Does more hits (23), ends the combo with a Heat Drive. Completely invincible and faster start-up. 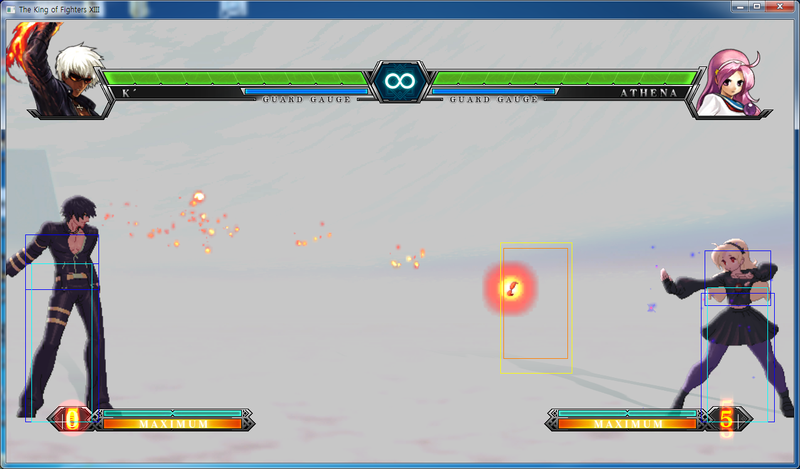 The last hit also works like Heat Drive and can extend the combo by doing Air Minute Spikes after the bounce. The easiest way to do this is to do qcb,b+B so that you get a back dash and save the input of your minute spikes. You'll back dash in the air if it's done properly. The timing is strict, but doing it insures you'll have more combo potential. Hyper Chain Drive = (hcbx2+AC) - K' punches the ground to make a volcano of flames rise from below him. Fast start-up, very good vertical range, meaning it can stuff just about any anti-air or jump-in the opponent may try to throw out. Combos from either of his DM's. Works really well in the corner. When used to KO the opponent K' emerges from the flames holding his gloved hand that is now cracked and almost falling off. Note: This combo will carry opponent's from corner to corner. Rather than post combos, this section will highlight ways to get into HD mode using the HD Bypass technique. By hitting HD mode in conjunction with doing a move, you can activate HD in a lot of different situations. You can also bypass into normals by canceling into HD really late. This links, if done properly, st.C after it. When you're on the offensive and you're converting a low-risk poke into a full combo. When you're on the defensive and you've successfully counter poked an opponent. When you're punishing someone with your 4F normal when st.C would either be far C or st.C is too slow to punish it. The starter string I included works from practically every range you'd confirm d.B d.B. Without meter, doing narrow spike links with st.C, f+A and allows you a full combo and more damage. If you're closer, you can do st.C (1 hit), qcf+C into a full combo, or you could hold down and do d.C into dp+A for a full combo. Choice is yours, either one will work. You can HD Bypass in the corner with your EX Air Minute Spike because it's an anywhere juggle. For one meter, you can convert a regular corner combo into a full HD combo. You can jump again and do qcb+CBD, do j.CBD (Any of the normals that come out in HD mode can be free canceled into Air Minute spike), or do what I suggested with j.CD and TK air minute spike, but it's a very useful tool that will make people very scared to be in the corner with you. Having full HD makes your regular combos that much more dangerous and scary. It also makes your pressure and air to air game even scarier since you can TK into HD from winning virtually any air to air. This situational HD is useful because it gives you many options. How it works is HD canceling a move that air resets an opponent from the second shell. Once you finish your dash, you have enough time to catch someone with a TKed EX air Minute spike. The reason why this is useful is because you can turn a confirmed blockstring into an HD combo, do a reset, or don't do d.C and simply go for a dp+C for a hard knockdown to keep your opponent in the corner. You have a lot of time to think of what would be the best use of your meter from this situation. This is not the only time you can do this off of an air reset. You can do this close to the corner by using far st.D as an anti-air. If you hitconfirm it and press HD, you can dash after your air reset opponent and go for a full combo right off the bat. This takes time and anticipation, but it converts your anti-airs into a huge punish for your opponent haphazardly jumping into K' air space. "(n) frame gap" = The amount of frames that opponent has to counter a frame trap. If n is 0 or -n, the particular frame trap is, initially, a block string. 1.) st. A > cl. C - 3 frame gap between st. A and cl. C. St. A whiffs on couching opponents, except on Raiden and Maxima when they are in guard position. 2.) st. A > cr. C - 4 frame gap between st. A and cr. C. St. A whiffs on couching opponents, except on Raiden and Maxima when they are in guard position. 3.) st. B > st. A - 3 frame gap between st. B and st. A. St. A whiffs on couching opponents, except on Raiden and Maxima when they are in guard position. 4.) st. B > cr. A - 3 frame gap between st. B and cr. A. 5.) st. B > st. B - 4 frame gap between st. B and st. B. 6.) st. B > cr. B - 3 frame gap between st. B and cr. B. 7.) st. B > cl. C - 4 frame gap between st. B and cl. C. 8.) cr. B > cl. C - 4 frame gap between cr. B and cl. C. 9.) qcf+AC > st. A - -7 frame gap between qcf+AC and st. A. St. A whiffs on couching opponents, except on Raiden and Maxima when they are in guard position. 10.) qcf+AC > st. B - -6 frame gap between qcf+AC and st. B. 11.) qcf+AC > cr. B - -7 frame gap between qcf+AC and cr. B. 12.) qcf+AC > far C - -1 frame gap between qcf+AC and far C. 13.) qcf+AC > far D - -2 frame gap between qcf+AC and far D. 14.) qcf+AC > cr. D - -3 frame gap between qcf+AC and cr. D. 15.) qcf+AC > st. CD - 3 frame gap between qcf+AC and far C. 16.) (corner) qcf+AC > cr. A - -7 frame gap between qcf+AC and cr. A. 17.) (corner) qcf+AC > cl. C - -6 frame gap between qcf+AC and cl. C. 18.) (corner) qcf+AC > cl. D - -4 frame gap between qcf+AC and cl. D. 19.) (corner, meaty, and hit on last frame only) qcf+C (+6 on block) > st. A (L) - -2 frame gap between qcf+C and st. A. St. A whiffs on couching opponents, except on Raiden and Maxima when they are in guard position. 20.) (corner, meaty, and hit on last frame only) qcf+C (+6 on block) > cr. A (L) - -2 frame gap between qcf+C and cr. A. 21.) (corner, meaty, and hit on last frame only) qcf+C (+6 on block) > st. B (L) - -1 frame gap between qcf+C and st. B. 22.) (corner, meaty, and hit on last frame only) qcf+C (+6 on block) > cr. B (L) - -2 frame gap between qcf+C and cr. B. 23.) (corner, meaty, and hit on last frame only) qcf+C (+6 on block) > cl. C (L) - -1 frame gap between qcf+C and cl. C. 24.) (corner, meaty, and hit on last frame only) qcf+C (+6 on block) > cr. C (L) - 0 frame gap between qcf+C and cr. C. 25.) (corner, meaty, and hit on last frame only) qcf+C (+6 on block) > cl. D - 2 frame gap between qcf+C and cr. D.
K' can play it safe from this range. He can easily anticipate and zone out projectiles that are thrown his way with EX/Eins + Shoot. However, therein lies the problem. From this range K' can only really zone. K' can build meter but only if the Eins + Shell hits the opponent (guard or not) otherwise it won't work. The range issue can be remedied by using moves like Eins + Blackout to quickly dash across the screen and into the opponent's face, then follow up with a crouch B combo starter. If there is have meter to burn, K' can also get by by using EX Minutes + Narrow Spike since it goes a good distance and it's much more safe on block than the weak/strong versions. EX attacks aren't of much use from this distance so stick to zoning/building meter. Drive/super canceling is out of the question. K' isn't as proficient with special moves here because a whiffed Eins Trigger + Shell is likely to get punished. K' can still get away with playing it safe though. Using moves such as Eins + Weak Blackout can help out from time to time when trying to get behind the opponent. As for offensive options, s.A as an anti-air poke, j.B/C/D for jump-in purposes, j.CD for that extra push, and crouch B will be his main combo starter. As mentioned before, whiffing Eins + Shell will get punished but is still usable. Timing is required, never just thrown randomly. Minutes + Weak Narrow Spike can also be used efficiently within this range. Crow Bites can work too, but be wary of punishes. This is also where K's DMs come into play. Chain Drive works after Eins + Shell, but the main DM of choice is Heat Drive because it plows right through the opponent after a juggle attack. EX attacks are of more use here but not of high priority. Super/drive cancelling options will come up from time to time. This is where the fun starts. K' can pretty much go all out and run right through his opponents defenses. His combo starters run from his s.A to his CD attack. Crouch B is great for starting BnBs from low attacks, while his stand C can go into his command normal and so on. Weak Eins Trigger is extremely good for building meter up close because it comes out really fast and goes away fast, making it a safe and pretty spam-worthy move. Eins + Shell juggles the opponent and sets them up for a variety of follow-up attacks. Crow Bites + Plus/Minutes + Narrow Spike/Heat Drive/Chain or EX Chain Drive enders. Drive/super cancelling have a myriad of uses here. Minutes + Narrow drive cancel loop works very well. Super canceling his Crow Bites to either DM is also good. Minutes combos into Air Minutes too here. NeoMax Hyper Chain Drive can be used as anti-air, but only if you feel like burning the meter to finish them off. K' can literally toy with opponent here. Everything from Eins Trigger to his j.CD works here. Cr.B is great, his j.D can be used in heavy blockstrings, and if they ever attempt to GC roll away out of the corner just run up and throw them. NeoMax can be comboed into as long as you use it after a juggle attack. Eins + Shell knocks the opponent into the air giving you a lot of options to continue with, namely his One Inch command normal. That can then combo into his Heat Drive and his EX/Chain Drive DM's. The main objective here is to get out of the corner, Blackout to EX Blackout are really good here. Just do whatever it takes to get K' out of there. Duolon is a very heavy mixup type of character. He's got a rekka series called Suteki Juryu which are generally unsafe, but his Hike Kyaku Zen, his teleport, allow him very good mobility to avoid being punished. He has a lot of right, left mix-ups. That is to say, he can make an opponent confused which side he can be on and force them into difficult blocking situations. He has very useful command normals, his f+A being a long high poke similar to Dhalsim and his f+B which hits on the ground from anywhere. During a rekka series, Duolon can free cancel into his teleport forward. The B version moves him fairly close while the D version moves him very far away across the screen. You can grab him out of the teleport with a normal throw, but the timing is very difficult. It becomes more difficult when the person chooses to delay the rekkas to throw off your timing or impossible when they use EX teleport. You can guard cancel roll the last hit of the teleport to put your close to him after he finishes his light teleport. Whether they did EX or light, you be close to them. For K' though, the heavy teleport can only be punished with Heat Drive and that's a tight window. If you lack meter or are not confident in this strategy, simply running after Duolon to close the distance will keep him honest or throwing a fireball to encourage blockstun. Keeping moving and denying your opponent air space is important. You do not want to let Duolon control the air as he can use his f+B in the air as a double overhead and his f+A as an air-to-air. Use your normals and get as much damage as you can out of exchanges by using Air Minute spike after each exchange. Whittle away at his life and pressure him into the corner as Duolon lacks anything without meter to get out of K' corner pressure. Joe vs. K' is a match of keep away. Joe employs frame traps such as light Thrust kick and Bakuretsuken(TNT Punch)to trap people in safe pressure. However, there are some holes in his strategy. All versions of his Golden Heel, Tiger Kick, and punches after 5 for Bakuretsuken are unsafe. Joe can cancel many of his normals into his f+B command normal and slide. st.A or st.C into this normal can be guard cancel rolled on the first touch of f+B because it's not safe on block. If they cancel into f+B into a special, it's not safe, you can do a regular roll or GC roll for a full punish as it is not a true blockstring (I.E. Joe does starter into f+B into Hurricane upper, roll through the hurricane upper). You can also risk using K' EX Blackout or Chain drive to blow up the follow ups he might do to his frame traps. Key things to do against Joe is block and deny him the air. Blocking light Thrust kick and Bakuretsuken and waiting for your opportunity to attack is the best idea (But be wary of throws!). Joe has very little safe movement on the ground and his normals, while decent, do not have a lot of horizontal range. Keeping in his face denies him the ability to safely apply frame traps. You can hop over Hurricane upper as well, giving Joe little time to react with his relatively slow DPs. Be careful though: Joe's EX Hurricane upper will stuff your regular and EX Ein Trigger into second shoot. However, you can GC roll the first one and go through it or use K' Chain drive which trumps his EX fireball. Leona vs. K' can be a frustrating match up. Keep in mind of her instant overhead j.A and j.D which can lead into a free combo or V-slasher with meter as well as her command overhead f+B. Make a note to, if you're on the defense, to give yourself some room and move as much as you can so she can't set you up to get hit. She has really strong normals like her low B which is positive, her st.B which hits low, a very long and fast sweep, st.D which is lower body invulnerable and a great HD hit confirm and her st.C which is a good poke since it moves forward really fast. Her Baltic Launcher and X-Calibur are useful tools to pressure people, collect extra damage, and to get in. With Moonslasher and Baltic launcher, it's even more difficult to get in! She has her earring bomb as well that allwos her to react with V-slasher if you full jump. So how does the Beast of Prey get in on such a hard mark? When Leona does any of her instant jump attacks or her air normals, she's not safe. You can score a full punish on her or just throw her on the way down. Keep track of what people like to do and at what certain spacings. On the defense, you should be mindful of her f+B overhead. After jump-ins, during light B pressure, or after safe specials, that overhead can cause problems and also has hard knockdown. However, it is slow. Being aware it might come will let you react with a punish like heavy crow bites or st.C. With meter, you have to be wary when you jump at her to avoid EX Moonslasher and V-slasher for their fast start up and invincibility. Make use of empty hopping to toy with their reactions and make them gamble on the wrong option. Try to keep in Mid/Close range so Leona does not have the time to react to your pressure. Using blockstrings like d.B, d.B, Ein Trigger will put you just close enough to walk forward and poke her with st.B or hop in for an attack. You can also choose to do nothing and block an expected reversal. Use this to keep at perfect distance or bait out reversals. Don't make a habit of using Ein Trigger from far screen, just throw out the C version and leave it unless they commit to running or X-calibur. Earring bombs have varying trajectories: Light goes 50% of the screen and bounces, so does EX but has longer bounce time. D version goes almost the full screen. Depending on which one, you can hop as it's descending. This is difficult, but you'll be able to block immediately if you do. If you're not confident in this tactic, walk forward and block, it's simple and lowers her spacing opportunities. Keep in mind that X-calbur's light version is not safe and the heavy version is only safe if you block crouching. Alternate between blocking crouching and standing often to take advantage of that with K' and quickly punish her with d.B. No version of V-slasher is safe on block so successfully baiting Her V-Slasher does not hit an opponent in an air-reset state unless it's counter hit so back dashing on a wake-up takes away a few options Leona could use on you. Your goal should be testing the reactions of the player and pressuring her into mistakes, but being mindful of her meter. Baltic Launcher is annoying, but it's not active for the whole time. You can sweep her through her active frames or use chain drive or an EX fireball to through it. You can sweep her after the active frames are gone on whiff. On block, however, it's very safe. Try to stay out of that range. Her heavy version is a bit higher so you can sweep her immediately if she whiffs that. Guard cancel rolling isn't a good idea, just be patient and wait for her. Overall, patience and proper spacing is the key to winning this match. Without meter, she's not very dangerous, but with meter, you must be careful. Either way, one mistake will be her last. 70 7 7 -6 weak attack 13, strong attack17, jump attack 17Frame startup? This page was last edited on 15 December 2014, at 19:56.